Chawl in Khotachiwadi: Conservation efforts have to involve the communities of users who keep urban habitats alive. 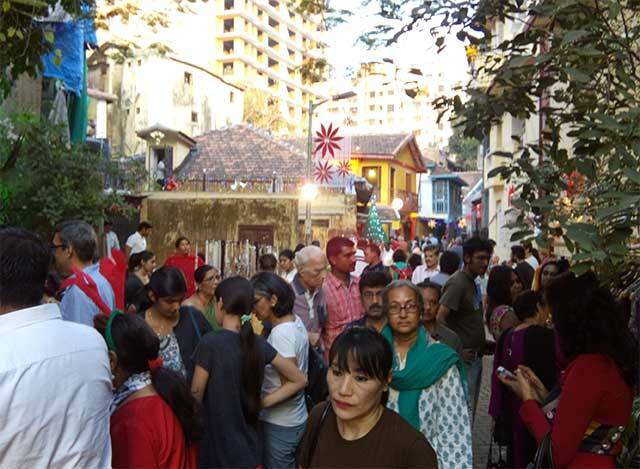 Khotachiwadi Christmas Fair. Chawls, bungalows, and active community spaces, along with a myriad of cultural identities, all co-exist here. Designer James Ferreira’s ancestral bungalow in Khotachiwadi has been converted into a workshop, a studio and a boutique. The dress pictured above is one of his creations. Just like the house, it merges legacy and variation in a masterly way. A recent airoots post discussed the nature of cities – the inevitable presence and influence of humans on their environment. “Natural cities”, as we call them, are spaces where landscapes, habitats and the people in them are constantly changing with and adapting to each other. The practice of trying to control the landscape, and direct its growth, leads to multiple problems. For example, the discourse of environmental conservation often frames the cityscape as something that needs to be preserved. This is a justified response to the destruction of land and resources that we see around us, thanks to the reckless working of a capitalist world economy. Unfortunately, whether the environment is simply considered as a natural resource to create consumer goods, or as a sacred space to be protected and untouched – it ignores the intrinsic human presence that constitutes it. It essentially constructs nature as something outside the realm of human life or vice versa, especially in the discourse on conservation. In the same vein, Mumbai’s Mithi River, which empties into the Arabian Peninsula, is the focus of strong conservation efforts that range from reclaiming it to “beautifying” it. However, such a narrative does not recognise the intensely organic, public activity that is already constantly happening around the river. The men who throw rotting flowers into it every morning to pray. The children who swim in it, the people who have actually made their homes on the banks of the river. These presences, the real users of the river, are entirely excluded from the narrative that attempts to “save” the river, speaking on behalf of the environment, but not speaking to it at all. The same simplistic narrative is present in the conversation efforts of urban heritage and architecture. By allowing only one kind of development narrative to monopolize the dimension of change , such efforts become closed to a lot of necessary and natural human activity that takes place in urban habitats. The problem with such an idea of development is not that it necessarily destroys heritage, which, like the environment, we seem to be fetishizing. The problem with it is that it occurs without the active influence and direction of ground-level users of the spaces that are being conserved. urbz’s work in Khotachiwadi, the urban hamlet in South Mumbai, aims to engage local residents of a neighbourhood that, like the Mithi River, is at the center of heated debates around conservation. Efforts to keep a neighbourhood frozen, in the name of protecting it from real estate developers, can be disastrous for the community. The fact is that the culture and nature of the people in the wadi is always changing and growing; many properties are becoming less practical for owners and tenants to keep or maintain. 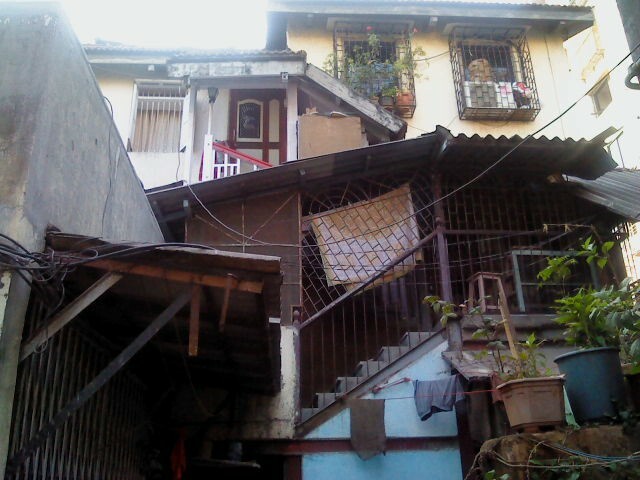 In the face of this, if one insists that the buildings and spaces themselves be preserved, without factoring in the concerns of those who live in them, the whole effort at conservation can easily lose relevance to its most important constituency, – the group of people with the most active interest in keeping Khotachiwadi alive, its residents. Khotachiwadi has a rich culture and unique history that has made it home to people of various backgrounds. Real development in Khotachiwadi can take place when this myriad of local identities are recognised and harnessed. Conversation between residents, the government, and builders can lead to promising outcomes. When the local community can engage and create economic value in the space, it can become more financially viable to maintain structures that have cultural significance, with the support of investors, donors or the government. A more active local economy would reassert the mixed-use nature of the neighbourhood and bring a new relevance to some of the bungalows that are underused, giving them new meaning. It is important to have a convergence of public and private spaces to maintain interesting and relevant urban setups. Builders then are able to create new structures that incorporate and speak to the present structures and context, rather than construct disproportionate buildings in isolation, that destroy the physical fabric of Khotachiwadi, as we see happening today. The natural city embraces and manifests human agency as the central force for the organic growth of cities. This human agency, whether it is in the reclamation of the Mithi River or the conservation of heritage neighbourhoods like Khotachiwadi, or the creation of tiny homes in Shivaji Nagar, is deeply political and needs to be intimately connected to the defining features of these spaces – the humans themselves. There needs to be a new way of looking at architecture and other aspects of our landscape. Rather than trying to protect the space because we are attached to a past that it represents, a new narrative would enable its relevance and encourage new forms of value to emerge from what currently exists. Keeping Khotachiwadi or Banganga Tank alive is thus a very spontaneous and natural impulse, which must be followed and infused with new ideas and strategies – and not stagnate in the struggle for conservation. What society really owes to both, the past and to nature, is an effort to bridge conversations, and develop a more sensitive and creative way to engage with them.